Ev is my best girl friend, and she and I have been enjoying each other’s company over good food for almost 14 years. We met in 1993 in Bogotá, Colombia when I was teaching at the embassy school, and our favorite haunt was a little Japanese store and sushi bar around Calle 98 and something or other (long time ago, memory a bit sketchy on location). Asian food was scarce and expensive in Bogotá, and it was such a *treat* for us to enjoy some Japanese food. We hung out together quite a bit during our first year there, then the next year she left to do Peace Corps work in Africa, and I later headed to Saudi Arabia. A few years later we met up again when we were both living in Chicago. She had married her Peace Corps partner from Africa, and she and I would go for a girls’ day or evening out to a local Korean restaurant and grocery store near Lincoln Square. When I got a new apartment in Logan Square, she would stop by for cocktails on Friday evenings after work and we would chat over some really good margaritas at a little hole-in-the-wall place near my apartment. We enjoyed many of those margaritas! After a couple years I moved on to the DC area and Ev and her husband and son stayed in Chicago. As fate would have it, she and her family ended up in the DC Metro area a few years later, and once again we were able to have some great girl talk over good food. This time our spot was a tapas bar in Old Town Alexandria where we really enjoyed the sangria! After about a year Michael and I moved to Hampton Roads, and she and her family went overseas again. When Ev and I got together again in March of this year, we had not seen each other in four years, but it didn’t feel that way at all. We picked up right where we left off, as if we had just had a girls’ night out the week before. She was in the DC area for work, and coincidentally we had moved back to the area that same week. The house was sporting that “just moved in look,” but she took it like family and stayed in our guest room, the only room in the house that we had managed to get ship-shape before she arrived. It was a bitterly cold, snowy night, but we headed out anyway for some good Asian food and conversation at a local Thai/Japanese restaurant. We’ve woven a thread in and out of each other’s lives over the years, and I venture to say that Ev and I will still be having girls’ night out when we are grandmas, even if we’re in different parts of the world and only get to see each other once a year or so. But every time I drink sangria or a margarita or enjoy some sushi, I think about all the good times we’ve had over food and drinks. So this Cinco de Mayo weekend, I’m making sangria to celebrate our friendship and I’ll drink a glass for Ev and her family. I know, sangria is Spanish, but that’s ok. It still goes well with Mexican food. Adapted from Cooking.com (attributed to Cha Cha Cha). 1. Combine the orange, lemon, sugar and wines in a large glass bowl or pitcher and stir for several minutes until the sugar is dissolved. Cover tightly with plastic wrap and refrigerate for at least 4 to 6 hours, or overnight. 2. Just before serving, add the optional fruits and spirits. Serve over ice or, just before serving, place some ice cubes in a punch bowl. Skip the sugar and use a white moscato wine instead of the chardonnay. It will be slightly sweet without all that sugar. Came here from tastespotting. Love your shot of Sangria. I have just returned from a vacation in Spain in April. It is now one of my favourite drinks. I love sangria! It’s been a while since I made some here, there is a pizzeria in Sao Paulo that has the best Sangria I ever tried. Did you ever come to Brazil while living in Colombia? Dilip & wmw: Thanks! I’d love to get to Spain sometime and enjoy some good sangria and tapas. Cris: I wish that I could have squeezed in a trip to Brazil when I lived in Colombia! That would have been really fun! A gorgeous photo! I love sangria and make it every summer. your photo looks really nice, I hav’nt made sangria before. But now i am desirous of making sangria. Thank you for your great sangria recipe. 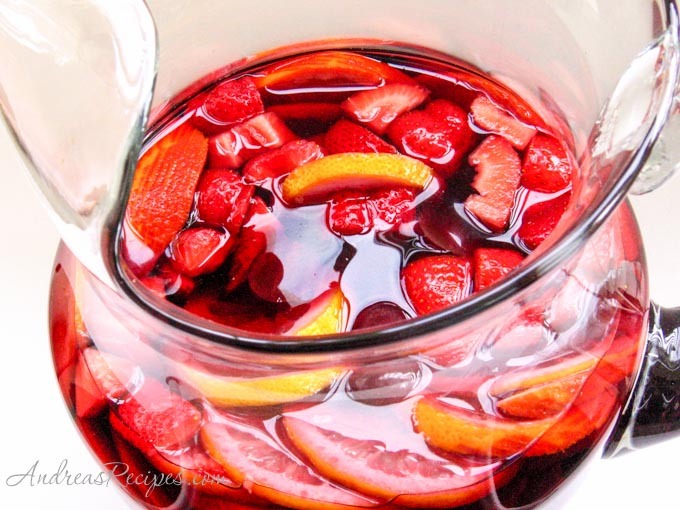 Love Sangria… Just what I needed for a summer day! I never had Sangria until last weekend when a friend and I went to breakfast at a little organic place in Tempe, Az. I am a wine lover and the thought of mixing it with something as a beverage was bothersome. But as I looked around and realized the delicious looking drink full of fresh fruits might be just what I wanted on a warm Arizona Sunday. I turned to discover my friend had already ordered a large pitcher of Sangria as a glass sat awaiting me. It was incredible. Now we joke about how she introduced me to the finer wines. It is a great treat for any day and really does go with any food, Spanish or not. I am in charge of brunch for the July 4th weekend/ bff birthday weekend and this is going to feature not just at the brunch table but as an every moment drink! Thank you ever so much. CC – just curious about the name of the organic Tempe spot you went to when you were here in AZ. I live here and am always up for discovering new places or frequenting old faves. If the feature sangria – might have to drag the hubby there soon!